'The Odyssey: A Northern Soul Time Capsule' is the single most comprehensive overview yet of a truly unique UK musical culture which has now lasted over 45 years and had spread across the world. The current popularity of the film "Northern Soul" and it's soundtrack plus the attendant publicity within the mainstream media - a UK Top 10 film smash, a UK Top 10 album smash and No.1 DVD smash have well and truly put Northern Soul at the forefront of people's interest again. This is a very, very exciting musical culture which now seems to be appealing to a younger generation of new fans in their teens who love the energy that Northern Soul provides and have the energy to burn off. Curated by well-known professional compiler, head of Harmess Records and 1970s Northern Soul DJ, Ian Dewhirst, 'The Odyssey: A Northern Soul Time Capsule' is very much a labour of love. The contributors to the project read like a who's who of Northern Soul's golden era. Ian Dewhirst and Anglo American's Tim Brown co-compiled the music and deliberated at length over the myriad of licensing issues. Mike Ritson, publisher of Manifesto magazine, kindly allowed us to use large swathes of his definitive book about Northern Soul, 'The In Crowd' to document the history of the scene. Simon White, journalist and broadcaster, interviewed, supervised and directed the collection of numerous interviews with most of the scene's best-known characters. Richard Searling interviews the world's longest-standing and most enigmatic record dealer, John Anderson, as well as squeezing in an interview with Philadelphia International's Kenny Gamble, who looks through Richard's collection of his own releases from the 1960's and sees many of these UK releases for the first time ever! Northern Soul history! Not one, but 2 DVDs. The 150 page book layout was designed by Glen Gunton and the overall package design by Jaffa - both long-serving Northern Soul stalwarts. The music follows the evolvement of Northern Soul, from its early beginnings at Manchester's Twisted Wheel club in 1968, through to The Golden Torch, Blackpool Mecca, Wigan Casino and Cleethorpes Pier in the 1970s, Stafford Top Of The World and The 100 Club in the 1980s and the huge dearth of Soul weekenders and the 100 Club again from the 1990's to the present day. Featuring a mind-numbing 222 tracks, all licensed from legitimate sources and all of which have been painstakingly re-mastered and documented within the sleeve-notes. The most comprehensive Northern Soul track-listing ever. 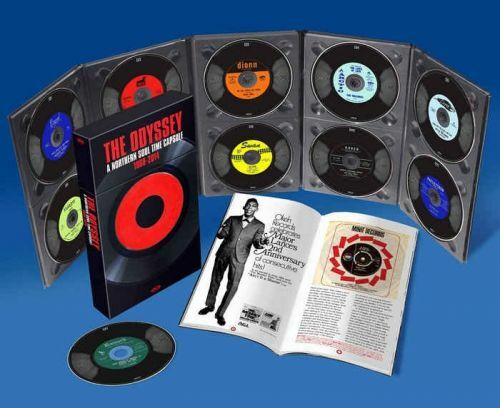 'The Odyssey: A Northern Soul Time-Capsule' truly does what it says on the tin. This is the most exhaustive history of the Northern Soul scene ever released.